With Syrian presidential elections scheduled for June, the incumbent and shoo-in for reelection, Syrian president Bashar al-Assad, is campaigning on the promise that 2014 will be the year in which military operations in Syria end. However, the situation in northern Syria, exemplified by the conflict in the canton of Kobani, an area stretching from the Turkish border to south of Kobani city, and from Tell Abyad in the east to Jarabulus in the west, casts doubt on Assad's optimism. Kobani is under Kurdish control, but cuts into a larger section of territory controlled by the Islamic State in Iraq and Syria, a jihadist organization. ISIS aims to hold a clear, contiguous area stretching from Syria's border with Turkey into western Iraq, where it controls territory in the provinces of Ninewah and Anbar. The existence of the Kurdish canton of Kobani interferes with this plan, and since March ISIS has launched daily attacks against positions held by the Kurdish People's Protection Units (YPG) at the edges of the enclave. The Kobani situation offers a window into the Syrian conflict, a fragmented reality where in large parts of the country the regime is little more than a memory, and well-organized rival militias representing starkly different political projects are clashing. Last month, I traveled to the Kobani enclave, entering from the Turkish border with Kurdish smugglers. The road was short but perilous—a sprint toward the border fence in the dark and a rapid, fumbling climb over it. The Kurdish enclaves are almost certainly the most peaceful and best-governed areas in Syria. However, the Kurds are aware of the precariousness of their achievement. Ali, a member of the Kurdish Asayish paramilitary police, told me that "Assad doesn't want to open another front now. But if he finishes with the radical groups, then he'll come for us, inevitably." In the meantime, as one PYD official said, "We take a third line, neither with the regime nor with the Free Syrian Army. We hope in the future to unite all the cantons. We accept a role for the Arabs, so we don't see a problem with this. And right now, we have one goal—keeping out ISIS." The PYD's "democratic autonomy" project in northern Syria put it on a collision course with ISIS, which is trying to lay the basis for an Islamic state run according to its own floridly brutal interpretation of sharia law. The resulting conflict then is not simply about territory, or who will rule northern Syria; it is also about how this land will be ruled. Mahmoud Musa, a Syrian political analyst and a refugee from the town of Jisr al-Shughur, told me that "there are three serious and well-organized forces in Syria today—the Assad regime, ISIS, and the Kurds." The last two regard themselves as at war with the regime. In reality, the rival mini-states they have carved out of a fragmented Syria are mainly in conflict with each other. ISIS has emerged as one of the strangest and cruelest of the many political-military movements now active in Syria. I spoke with a young Kurdish man named Perwer who had spent a week in ISIS captivity. He was arrested at the Jarabulus border crossing, while returning to Syria from Istanbul. First detained by members of another Islamist unit, the Tawhid Brigade, he was then handed over to ISIS and kept for five days in one of the movement's jails in Jarabulus town, just west of the Kobani enclave. ISIS's mini-state reaches from the edges of Kobani to deep inside western Iraq. I visited the frontlines on the eastern edge of the Kobani enclave, where the positions of the YPG and ISIS push up against each other. In Tell Abyad, the two sides are camped in abandoned villages, where the ruined landscape has a slightly lunar quality. Eyewitnesses told me that ISIS forced the villagers to leave when the fighting began. Young fighters of the YPG moved carefully around their positions in the abandoned village, ever mindful of the presence of ISIS snipers. In places, the two sides are less than 500 meters apart. ISIS favors mortar fire by night and sniping by day. This has taken a toll on the male and female fighters of the YPG. Around 80 of them have died since the fighting erupted in March. Many more ISIS men, however, have been killed in their wild and uncoordinated attacks. "They outnumber us, often. But they lack tactics," said Surkhwi, a female fighter and the commander of the Kurdish fighters in the village of Abduqli. "We think many of them take drugs before entering combat, and they attack randomly, haphazardly. They desecrate bodies of our fighters, cutting off heads, cutting off hands. They don't respect the laws of war," Surkhwi told me. "We also know that ISIS look at us women fighters as something not serious, because of their Islamic ideology. They think that if they are killed by a woman, they won't go to paradise." Abu Nur outlined his reasons for joining the organization. He had been a member of the Northern Storm militia, a notoriously corrupt non-Islamist militia group that had controlled the Bab al-Salameh border crossing from Turkey. The incident that had compelled him to leave Northern Storm and join ISIS, he said, was Senator John McCain's visit to Bab al-Salameh in the spring of 2013. Abu Nur explained that he is suspicious of foreign governments using Syrians for their own ends, so when fighting began between ISIS and Northern Storm in his hometown of Azaz, he joined ISIS, which laid waste to his former colleagues in the subsequent weeks. He had stayed with ISIS, he told me, because it "imposes sharia, acts against criminals and robbers, and has no contact with any foreign government." When I asked Abu Muhammad about ISIS's practice of cutting off hands and heads as lawful punishments, he told me that "the media have exaggerated this. In certain areas they cut hands off, in others not," he said. "We have tried our best to apply sharia law. Of course there have been some mistakes." ISIS has recently carried out a strategic retreat in parts of northern Syria, which in some ways resembles the earlier redeployment by the regime. In January of this year, under pressure from other rebel brigades, ISIS began to withdraw its fighters from Idleb and much of Aleppo provinces, concentrating them in its Raqqa stronghold and further east. Abu Mohammed explained the reasons for ISIS's redeployment. "If there are powers against me, I have to retreat and protect my back. And perhaps in the future I will return again." ISIS rules over large swaths of western Iraq's Anbar and Ninewah provinces, where its fighters are engaged in an insurgency against the government of Nuri al-Maliki, who has been employing sectarian tactics against the Sunnis. So there is a strategic logic to ISIS contracting its forces and drawing down in northwest Syria. The problem for the Kurds is that the Kobani enclave falls within the area that ISIS still seeks to dominate. Abu Muhammad expressed the matter clearly: "The YPG wants to establish a Kurdish state. This is completely unacceptable. We want the caliphate, something old and new, from the time of Mohammed. The Europeans created false borders. We want to break these borders." Still, ISIS's plan to destroy the Kobani canton is unlikely to succeed. 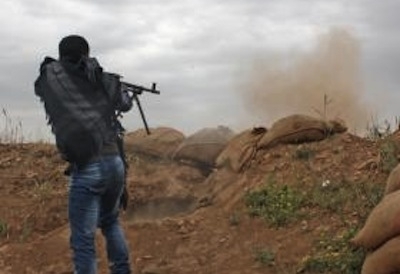 The Kurdish administration and its militia are capable and well organized, and will continue to defend the enclave's borders with weapons and supplies smuggled from across the Turkish border. There are veterans of the Kurdistan Workers' party war against Turkey advising the PYD on both civil and military matters. They appear more than able to stave off ISIS, and to continue to develop the institutions of their autonomy. Bashar al-Assad may please himself with the farce of elections, but the wars within wars, competing worldviews, and irreconcilable projects, in northern Syria are testimony to the fact of the country's fragmentation. They reflect also the rapid change still underway in the Middle East, as old ideas and regimes contract and fade, and new contenders for power make war among the ruins. Jonathan Spyer is a senior research fellow at the Global Research in International Affairs Center in Herzliya, Israel, and a fellow at the Middle East Forum.